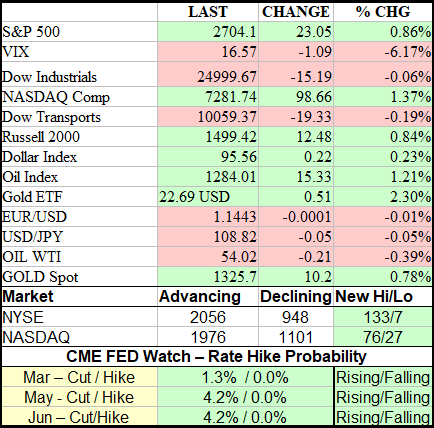 The market moved higher on strong earnings and confirmation the FOMC is close to ending quantitative tightening. Today's move wasn't strong but it was nice to see following Wednesday's FOMC driven rally. The FOMC has confirmed what the market was already coming to believe; the pace and trajectory of future interest rate hikes will be much slower and lower, interest rates will stay low for a prolonged period of time, and the end of quantitative tightening. Quantitative tightening, otherwise known as the Fed's Balance Sheet Run-Off, has been sapping liquidity from the US economy and one of three hurdles for the bulls the market has now overcome. Another hurdle, fear of economic/earnings recession, has also been swept away. The fears, driven in large part by the FOMC tightening cycle and trade woe, were overblown in most cases. The earnings reports we've seen so far haven't been great compared to 2018 but they are much better than expected (on balance) and the outlook for 2019 isn't as bad as the sell-side analysts led us all to believe. With the FOMC off the tightening cycle, it is possible economic growth could begin to re-accelerate. The final hurdle blocking the path to new all-time highs for the broad US equities market is the China/US trade impasse and even that seems to be gaining positive momentum. The trade-talks between Chinese Vice Premier Liu He and Trump's top aides have progressed to the point a meeting between Trump and Xi is in the works. There are still some sticking points to be hammered out, and the meeting would take place in late February after the next Trump summit with Kim Jong Un, but it's still big news for markets to latch on to. Initial jobless claims surged unexpectedly over the last week but maybe showing impact from the government shutdown. The report doesn't make special note of the shutdown and only tracks civilian government employees but the number of those has been steadily rising over the last few weeks. 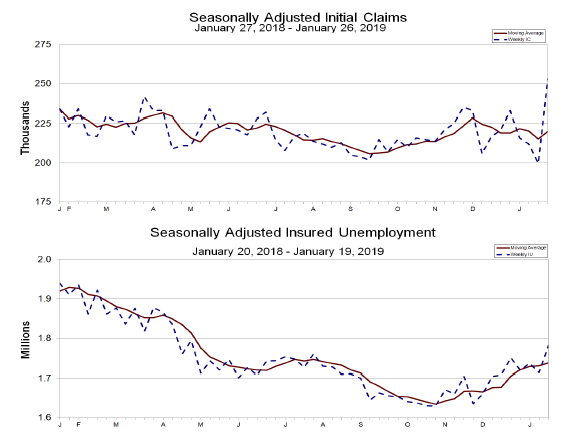 The number of initial claims jumped 53,000 to hit 253,000 and the highest level since September 2017 (that high was driven by storm-related outages). The four week moving average of claims rose 5,000 to hit 220,500. The surge in claims is troubling and needs to be watched to see how long it lingers. Based on all other labor-based data points and the end to the shutdown I do not expect this figure to linger long at these elevated levels. Continuing claims rose 69,000 to hit 1.782 million. This is the largest number of continuing claims since 4/28/17 and another red flag linked, at least in part, to the government shutdown. The total number of jobless claims fell -66,958 to hit 2.148 million. This decline is in line with expectations and helps confirm the peak in claims reached last week, with one caveat. 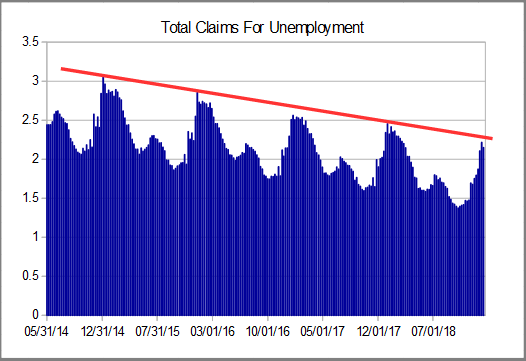 This data lags the initial claims data by two weeks and could easily see another spike as the impact of government shutdown works its way through the system. On a year over year basis claims are down 7.2% and consistent with long-term labor market trends. 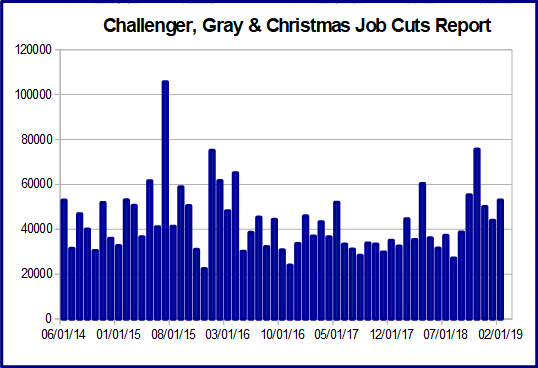 The Challenger, Gray & Christmas report on planned layoffs shows the number of planned job cuts rose 20.7% in the last month to 52,988. This is 18.7% above the same month last year and evidence employers are downsizing their workforces post-holidays. The retail sector led the job cuts but cuts were fairly broad, looking at it relative to all January's this month's cuts are below average but skewed to the high-end of the range. More importantly, while job cuts linger in some sectors others are still hiring. The number of planned hires topped 74,000, oddly enough led by the retail sector, which suggests labor-market weakness in the retail sector is very isolated. The fourth quarter employment cost data was a bit better than expected. The Employment Cost Index rose only 0.70% versus the 1.0% expected. The gains were driven by a 0.60% increase in wages and a 0.7% increase in incentives. On a year-over-year basis, civilian labor costs have risen 2.9% while private business labor costs have risen by 3.0%. 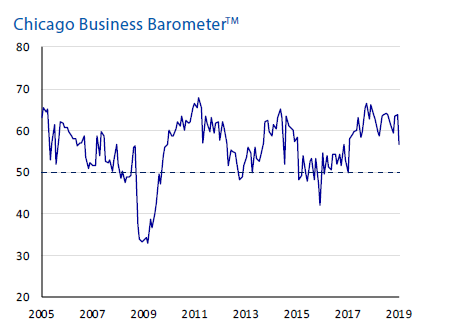 The Chicago Business Barometer (PMI) fell -7.1 points to 56.7. This is the weakest level in two years but still a solid read and well above 50. Four of the five sub-indices were lower in the last month led by new orders and production. Despite the decline, this is the 24 month of readings above 50 and evidence economic expansion is still underway. The risk is that PMI will continue to slacken until activity begins to contract but that has been mitigated in large part by the FOMC, earnings outlook, and labor data. 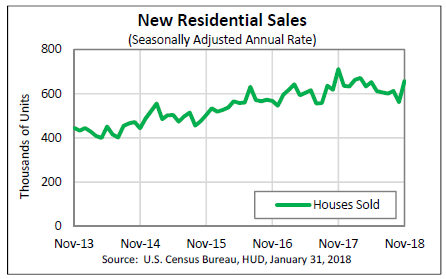 New Homes Sales was not originally scheduled for today, it is the first of the shutdown-delayed data to be released. The data is good but lagging by two months so take it with a grain of salt. The number of New Homes sold in November jumped 16.9% to 657,000. The increase was driven by fear of rising rates and helped to spur the homebuilders higher in today's action. On a year over year basis, sales are still trending lower by 7.7%, based on some recent mortgage app data that may change this year. The Dollar was able to regain some of Wednesday's losses and may be confirming the bottom of a trading range. 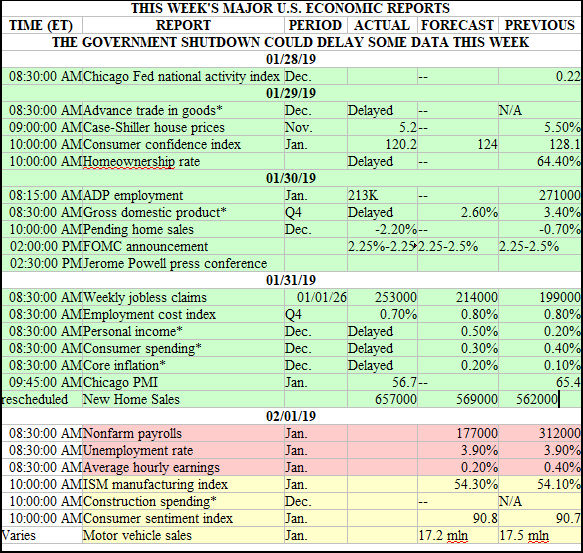 Today's action was driven by the data and trade news as one point to modest US economic growth and the other could open the doors to economic expansion. The FOMC's policy statement weakened the dollar but was as-expected so largely discounted by the market. Additionally, yesterday's ultimatum from the EU to the UK weakened the EUR and the GBP. The EU says there is to be no renegotiation on Brexit, the UK can take it or leave it, and puts the UK in a tight spot; take it or leave it. Support for the DXY is still at $95.50 and a reversal at this level looks possible. Gold prices were able to hold steady in today's session. The metal tried to move higher but fell back to break even by the end of the session. 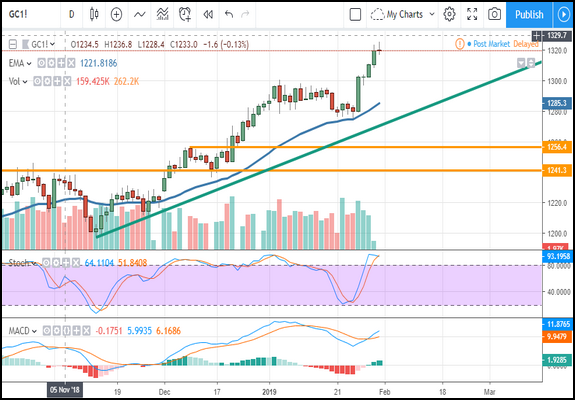 The candle is small and doji-like so may mean nothing but for now, there is a potential for resistance at the $1,320 level. If resistance holds at this level a retracement to support may follow. A consolidation and move above $1,320 would likely continue to $1,340. 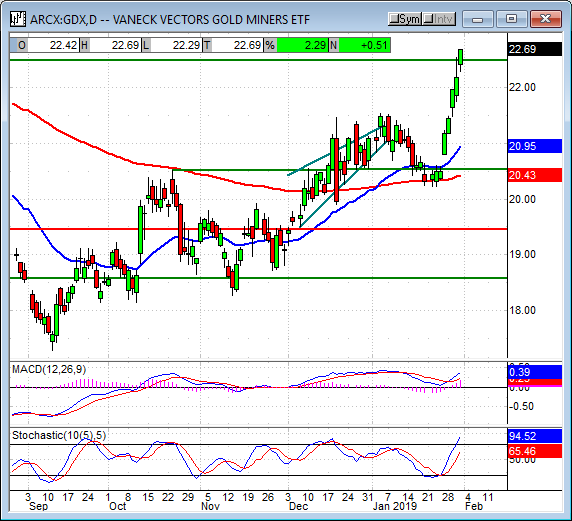 The Gold Miners ETF has extended its break of the $22.50 level and looks like it could go higher. 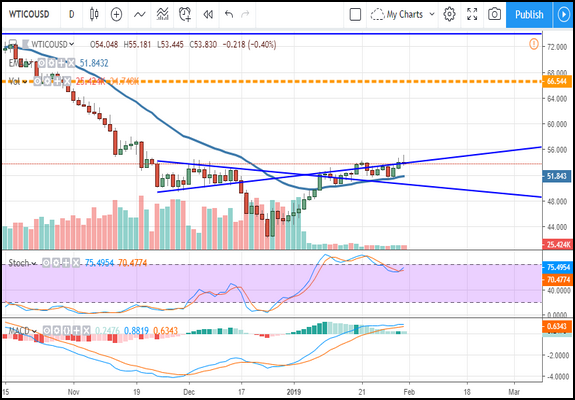 The near-term rally in gold stocks seems to be gaining momentum and likely to continue to gain momentum while gold prices are on the rise. The indicators are both bullish and rising so higher prices are expected. My next target for resistance is $23.00 and then $24.00. Oil prices moved up strongly on word the Saudi's were cutting exports to the US. The cuts are part of the OPEC deal to curb production and more than the Saudi's quota. The news helped push WTI above $55 for the first time in nearly 3 months but the outlook for US production and concerns for global demand capped the gains. 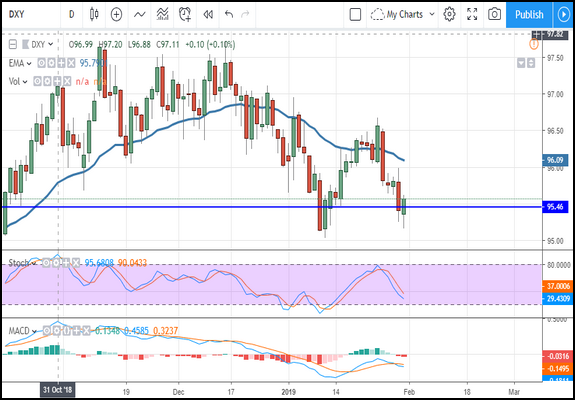 By the end of the session, WTI had given up all the days gains to close beneath resistance and within the near-term consolidation range. The Oil Index moved up to close with a new near-term high but the candle is small and continuation is questionable. The index may be ready to move higher but, based on the expectation for earnings decline in 2019, I am not to optimistic about it. 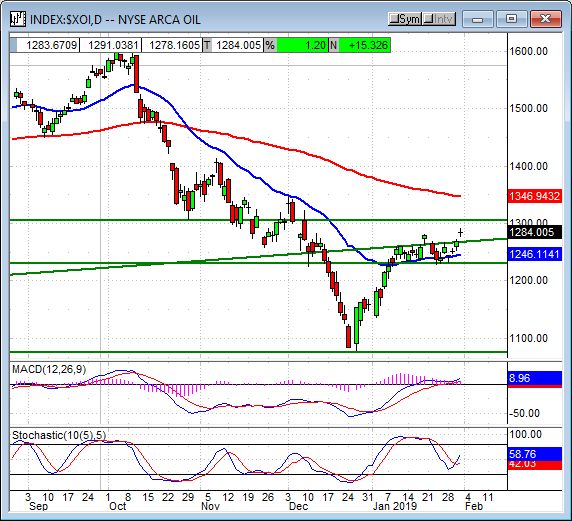 A move up is likely to find resistance at the 1,300 level and then the long-term moving average if it does materialize. If not, support may be found at 1,275 or1,250. 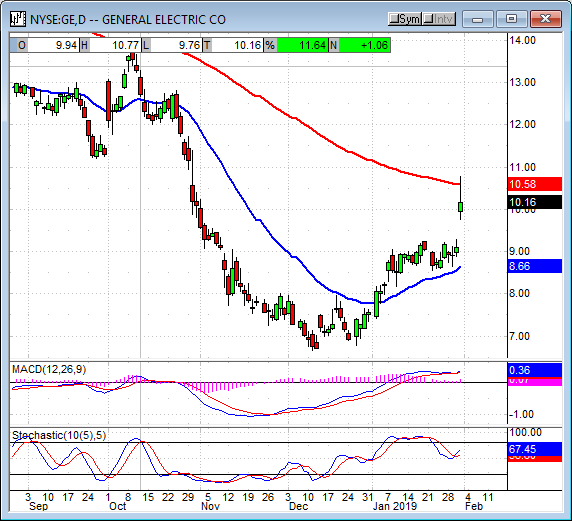 GE saw strong gains in today's session after it beat earnings expectations. The company produced a 60% decline in profits over the last year but revenue grew and some other positive factors were announced. The number one is that GE has settled its DOJ investigation of accounting practices for $1.5 billion dollars. CEO Larry Culp says the company's turnaround is progressing nicely and the worst is nearly over. The company's cash flow is going to be hurt by restructuring charges and efforts to deleverage the balance sheet, investments in the healthcare business, and some other one-time items but those costs will pay off over the long-term. Shares of the stock jumped 10% at the open and moved higher from there. The only negative I see is that some shareholders took this opportunity to get out of GE and that sentiment may cap gains in the near to short-term. Shares of Amazon were flat in the after-hours session after reporting blowout earnings. The company says revenue grew 20% led by a 46% increase in AWS revenue and EPS is $6.04. The EPS beat is substantial, nearly $0.40, but EPS is hit-or-miss with this company depending on how much they spend and where. Guidance for the next quarter is strong but on the low side of consensus which is likely what shares held steady after the report. 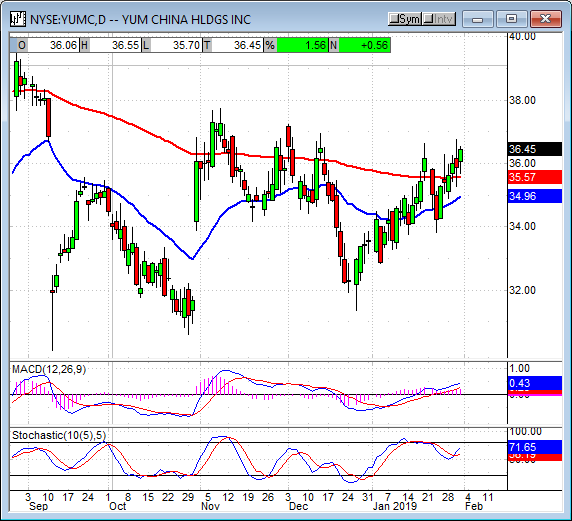 Shares of Yum China were up more than 6% in after-hours trading after it reported earnings. The company says sales have not been hurt by the US/China trade situation but growth is mixed at the segment level. Total same-store sales increased by 2.0% led by 3% increase at KFC and lagged by a 4% decrease at Pizza Hut. Operating margins narrowed slightly but operating profits are up 77% so investors didn't care. Shares of Symantec were also sharply higher in the after-hours session. The company beat on the top and bottom lines and provided better than expected forward guidance on strength in both consumer and enterprise segments. Symantec also increased its buyback program to $1.3 billion which will provide a lot of support in the future. Shares were up more than 6% on the news. Today's index action was mixed in terms of result but generally bullish relative to the market. The day's leader is the NASDAQ Composite with a gain of 1.37%. The tech-heavy index created a small green bodied candle moving up to break the long-term moving average and extend the bounce from the short-term moving average. The indicators are confirming this move with a strong bullish crossover so higher prices are expected over the next few weeks. A move up from here may find resistance at 7,500, a move above there could go as high as 8,000. The S&P 500 closed with a gain of 0.85% and above its long-term moving average. 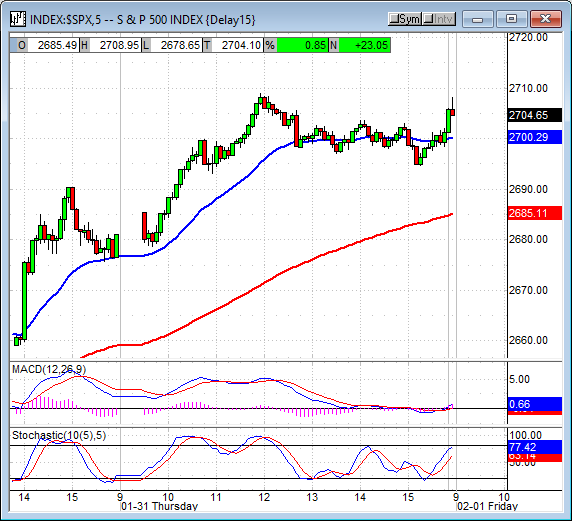 The index is extending the bounce from the short-term moving average support zone and is indicated higher. 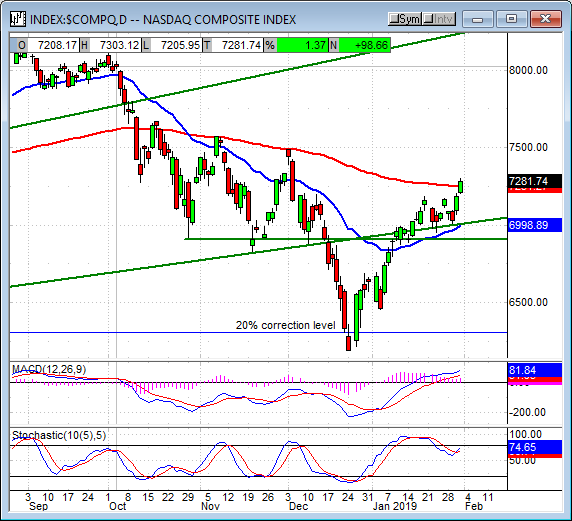 The indicators both show bullish activity that suggests a move to 2,775 is possible. The caveat is that the signal is still weak so tight stops are recommended for bullish positions and profits should be taken on short-term positions if resistance targets are reached. The Dow Jones Industrial Average closed with a loss of -0.06 but it created a green candle in the process. The index opened with a slight loss and then moved up for most of the day as traders scooped up discount stock. The index is consolidating above the long-term moving average and supported by the indicators so another push higher is expected. The next targets for resistance are 25,250 and 25,750, a move above there would be bullish. 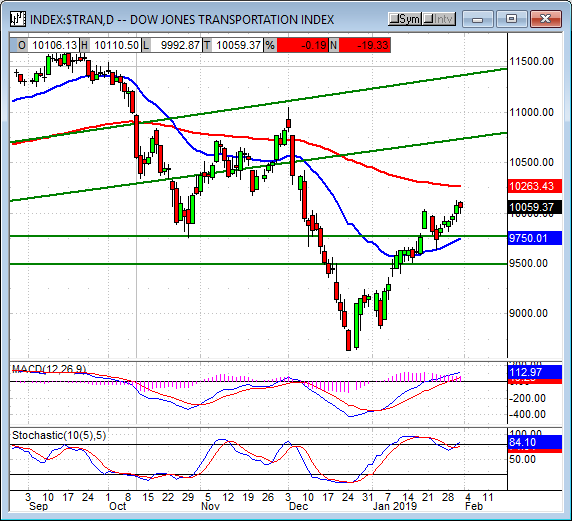 The Dow Jones Transportation Average closed with the largest loss, -0.19%, and created a red candle but the action is still more bullish than not. 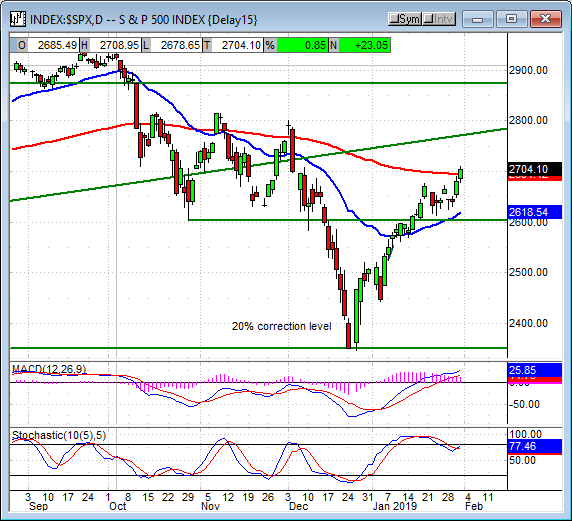 The index opened with a gain that would have been a new closing high and then moved lower to test support near yesterday's close. The candle shows that there is some support present and the indicators concur so a move higher is expected. Both indicators are bullish but momentum is weakening so resistance at the long-term moving average may cap gains. 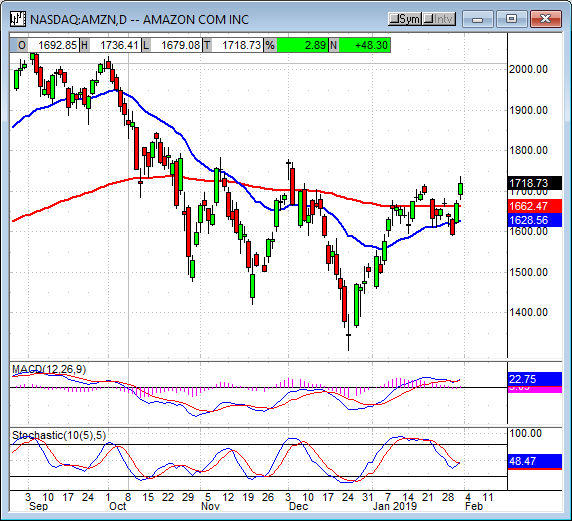 A move above the 150-day EMA would be bullish. The market is slowly coming back to its senses. The fears that drove stocks to a 20% correction are dissipating. We're not out of the woods yet but earnings aren't as bad as the analysts thought they would be, the FOMC has taken its foot off the economic brakes, and trade tensions on are on the mend so I think it is safe to say the risk is to the upside. Economic activity could easily re-accelerate in 2019, analysts outlook could brighten, and earnings could beat expectations so there is a solid chance we could see a sustained bull market rally this year. I am firmly bullish for the long-term but still only cautiously bullish for the near-term. Better safe than sorry.